I used the Canon 1D mark IV for almost 5 years, it was a great camera and I loved the ability to get 10 frames per second to get a better chance of capturing interesting moments but I did very often find that I did not have enough reach. I was often cropping my 16 MegaPixel pictures down to a point that they were ok on the internet but as soon as I tried printing them the details started falling apart. As technology has been improving on all fronts in photography we started seeing higher resolution cameras that also had some reasonable tracking capabilities, although they were definitely much slower in terms of frames per second and how big the buffer was. 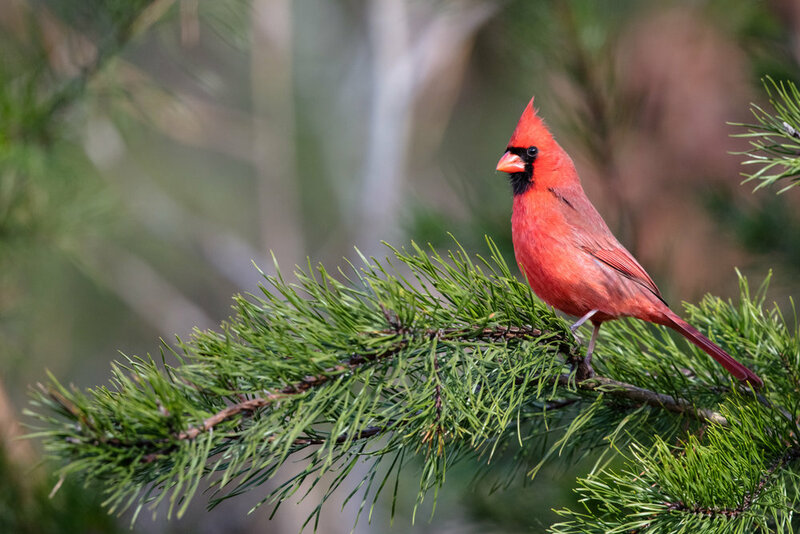 Northern Cardinal - Canon 5DS with Canon EF500mm f/4L IS II USM +1.4x III. 700mm, f/5.6, 1/1250s, iso1600. Moving to a higher resolution camera, I bought the Canon 5DS originally for landscape and detail shots. This camera with a 50 MegaPixel sensor was then as is still now the highest resolution full-frame camera on the market. It had the pretty much the same autofocus system as the 5D III which at the time was pretty top tier, and really only the 1DX and Nikon equivalent were significantly better/faster at that time. I started using it for high detail bird and nature shots and soon found myself using it for action shots. I really got hooked on the detail more than the ability to get more shots per second. This meant going back to what I used to do with older slower cameras trying to time my shots to ensure I got the precise moment in a action sequence….of course I missed moments that I might have gotten with the 5D IV but when I did get it, I often had a shot that was able to be printed much larger. 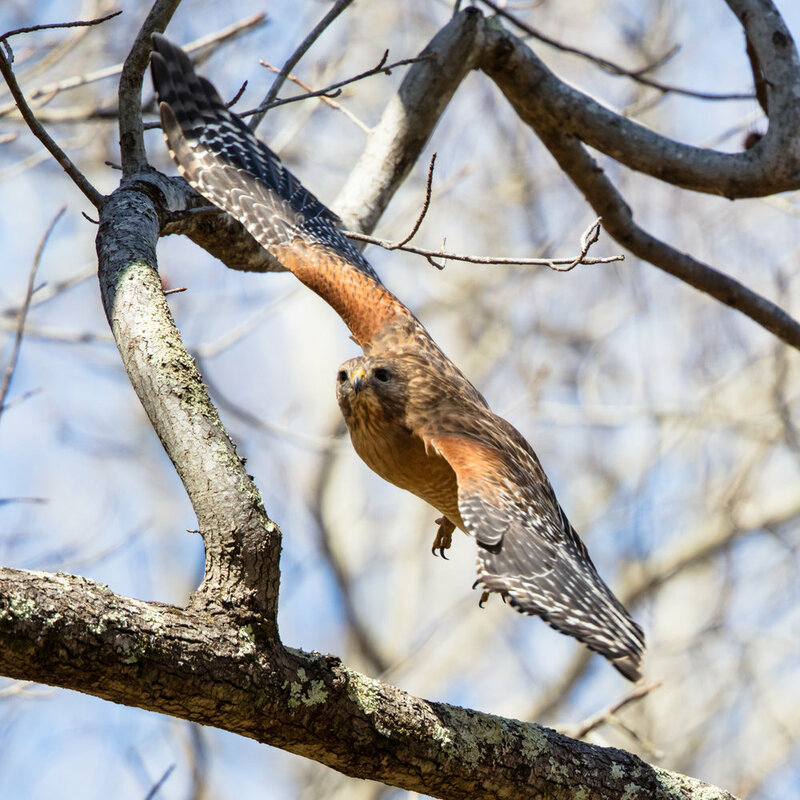 Red-shouldered hawk taking off. Canon 5DS with Canon EF500mm f/4L IS II USM +1.4x III. 700mm, 1/1250s, ISO 800. Original 8688x5792 cropped to 4178x4178. Printable at 300DPI to nearly 14 inches. Image posted at 2000x2000. The ability to crop in on action is liberating since you can’t always get perfect composition while things are moving fast. This allows you to keep action close to the center for good autofocus tracking while shooting and crop the composition that fits the shot afterwards while still keeping enough detail for a good size print. This is starting to become less important with new mirrorless cameras that can focus just about anywhere on the sensor allowing easier composition while tracking, reducing the amount of cropping you need to do. It is nice to have both resolution and full sensor tracking, and nice to have the choices after the shot. Highly cropped image of a red-headed woodpecker. Taken with Sony A7RII using Canon EF 100-400 F4.5-5.6 IS II and Metabones adapter. 400mm, f/5.6, 1/1000s, ISO 400. Original shot 42 MegaPixels cropped to 1543x1543. To get a sharp image, you always need to think about technique while shooting. I shoot mostly hand held, even with the 500 and 1.4 teleconverter. You need to be close to or even faster than the reciprocal rule (see explanation below) but the image stabilizers do give you a bit more leeway. The other big bonus of this high resolution is in landscape photography and nature environmental shots. People have asked me why I didn’t go with the 5DSR and the answer is pretty simple….I saw a refurbished 5DS on the Canon web site for nearly $1000 off the list price at the time I was looking for a new camera. The difference to me was not worth another grand. Osprey landing in Sparkleberry Swamp. Taken with Sony A7RII from a kayak. Sony FE 100-400mm F4.5-5.6 GM OSS + 1.4X Teleconverter. 560mm, f/8, 1/2500s, ISO 1600. Cropped from original shot below. Once I became hooked on the resolution, I started seeing that I could get both high resolution and better tracking/faster shooting. I love the fact that technology is quickly improving to a point that I can do many things I thought were just not possible a few years ago. As new cameras come out, you no longer need to choose between high resolution or high number of frames per second. Sony A7RIII and Nikon D850 are already there, and I’m pretty sure that the technology in the Sony A9 will make it into higher resolution cameras within the next 3-5 years. So far Canon doesn’t have anything in this space but I would imagine it is just a matter of time now that they have the EOS R. They really just need to be able to process the data coming from the sensor a bit faster…..they have everything else in one camera or another. Since getting the Canon 5DS I have also gone high resolution on the Sony side. Sony A7RII has also become critical for me, with the Sony 100-400 and 1.4 teleconverter I have reach and detail and can do tracking focus across nearly the whole sensor even at f8. I do still keep a lower (funny how 24 MegaPixel can be considered low resolution to me now) resolution Sony A7III to get that 10 frames per second and great low light shooting when I do need it. That is a pretty great cheap way to get those capabilities. 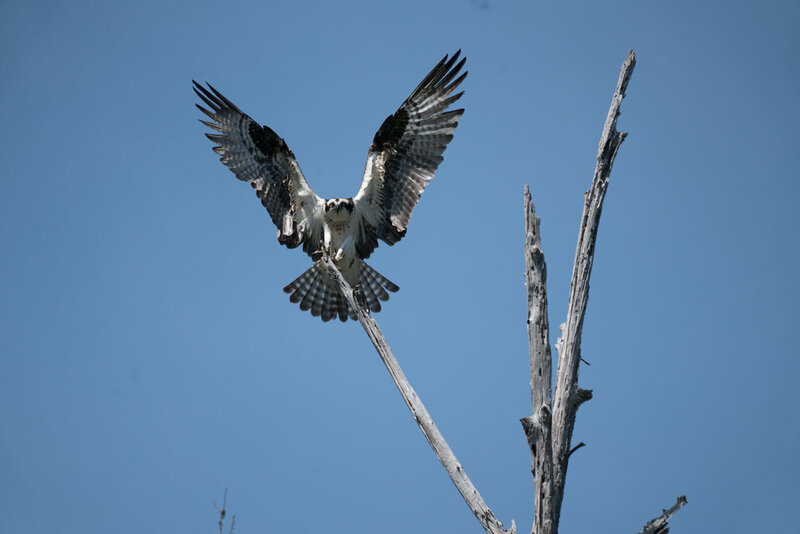 Osprey landing in Sparkleberry Swamp. Taken with Sony A7RII from a kayak. Sony FE 100-400mm F4.5-5.6 GM OSS + 1.4X Teleconverter. 560mm, f/8, 1/2500s, ISO 1600. Original 42 MexaPixel image. Reciprocal rule: Even with good image stabilization this is very important especially as you get to longer glass handheld. Even though there may not be any difference in the amount of movement you have, you will be able to detect that movement more as your resolution increases. Remember that if your subject is moving, you may still need a higher shutter speed to ensure that you stop the motion. 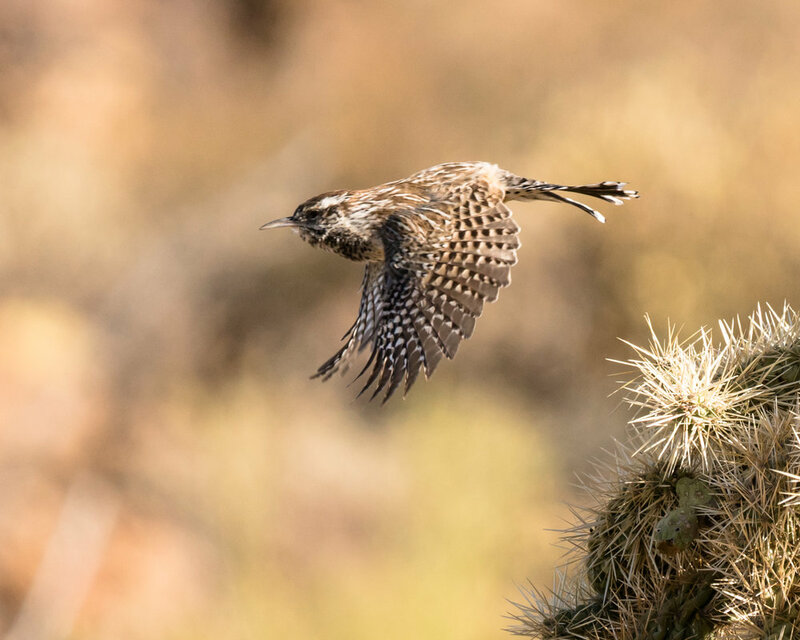 Cactus Wren taking off. Cropped image from Sony A7RII. FE 100-400mm F4.5-5.6 GM OSS. 400mm, f/6.3, 1/2500s, ISO 800. Explanation: skip over this if old news to you. In general for full-frame cameras the reciprocal rule is a good guideline for capturing subjects without ending up with some blur due to the cameras movement while the shutter is open. To ensure sharp images of moving subjects you may need faster shutter speeds still. With no stabilization and reasonably good technique handheld you should be able to get sharp images with a shutter speed that is the reciprocal of the focal length of the lens. This is definitely a guideline to start with and it is a good starting point. So if you have a full-frame camera and a 400mm lens, a 1/400 shutter speed would be a good starting point for a subject that is not moving quickly. If you are using a camera with a smaller sensor then multiply this by the crop factor for the starting point. Now with the latest lenses and cameras that have image stabilization you can get sharp images at shutter speeds that are much slower (longer duration of the sensor being exposed). I have found that on static objects I can get about 5 times (more than 2 stops improvement) on the Canon and closer to 10 times (more than 3 stops) on the Sony where there is both camera and lens stabilization. Both companies will advertise that you can get more than that but this is what I have experienced handheld in most conditions. Great Horned Owl from a perch high in a White Pine, far enough that I had to crop in significantly. Shot handheld with Canon 5DS with EF500mm f/4L IS II USM +1.4x III. 700mm, f/7.1, 1/125s, ISO 1600. Subject movement: In these cases we are not taking into consideration subject movement or camera movement while shooting. For moving subjects I will try to never get below 1/1000s and for small birds in flight I will normal double that again. I do this not because they are smaller, but because they move very quickly and I have to be closer to them. This will often mean higher ISO than I would prefer but a little noise is something you can work with, a blurry subject is most often (unless you are specifically going for that) going to mean a lost shot. Female Mallard taking wing. Using fast shutter to stop wing motion….still a little visible at wing tips. Canon 5DS with EF500mm f/4L IS II USM +1.4x III. 700mm, f/5.6, 1/4000s, ISO 1600. Hand held technique: The longer and heavier the lens the more you will see the effects of your good or bad technique. Holding your breath as you focus and as you hit the shutter can reduce some shake and I have found to be a good way for me to concentrate on being steady. Find a way to stabilize your arms, elbows in to your body if standing. If you can stabilize your body or the camera against a tree, fencepost even better. 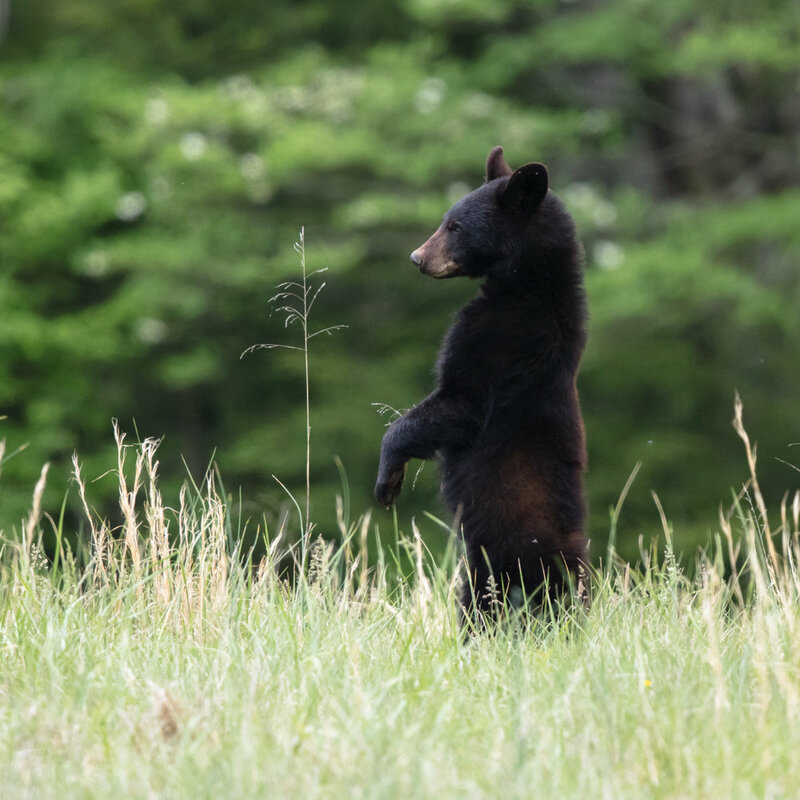 Young black bear in the fields in Cades Cove. I would often use fence posts to help steady my shots as I waited for action from these bear. Taken with Canon 5DS using EF500mm f/4L IS II USM +1.4x III. 700mm, f/5.6, 1/640s, ISO 1600. Smooth motion while tracking: This gets more difficult as the lens gets longer and heavier. When I first got the Canon 500mm it took quite a few weeks of shooting to get used to keeping a subject tracked even though I had been using a 100-400 with the 1.4 teleconverter regularly. The length of the lens was a new challenge to keep steady as was the different weight distribution. Every lens and camera combination has a different center of mass, and you hold them at slightly different points. I have found that the only real way to adjust to this is more time practicing. Panning is a difficult technique to perfect and it only gets more difficult as your resolution increases. Smooth movements and smooth action on the shutter button will give you the best chance to get a sharp subject. What I’m hoping for in the Future and what I think is coming. There are still times that having 10 or even 20 frames per second is useful, I have missed what I think was the best moment in a string of shots. However, I have learned to work on the timing and when I get the shot I can do more with it than before. I keep a Sony A7III with a 100-400 within reach for those moments that look like they will turn into faster action. What I would love to see in the next few years is a combination of what I already see either coming down from high end cameras or just putting a number of existing bits in one camera. The Sony A9 and the Nikon D850 as well as the Sony A99II that has been mostly forgotten have a good deal of the technology that I think will be common in a couple of years. Currently and with the coming firmware updates the Sony A9 has most of the autofocus capabilities that I can currently imagine needing. I’m sure the first implementations of animal eye autofocus will not be perfect but that will be fantastic as it improves to a point that all I really need to do is choose the animal/eye I want and then I can purely concentrate on the composition and action. 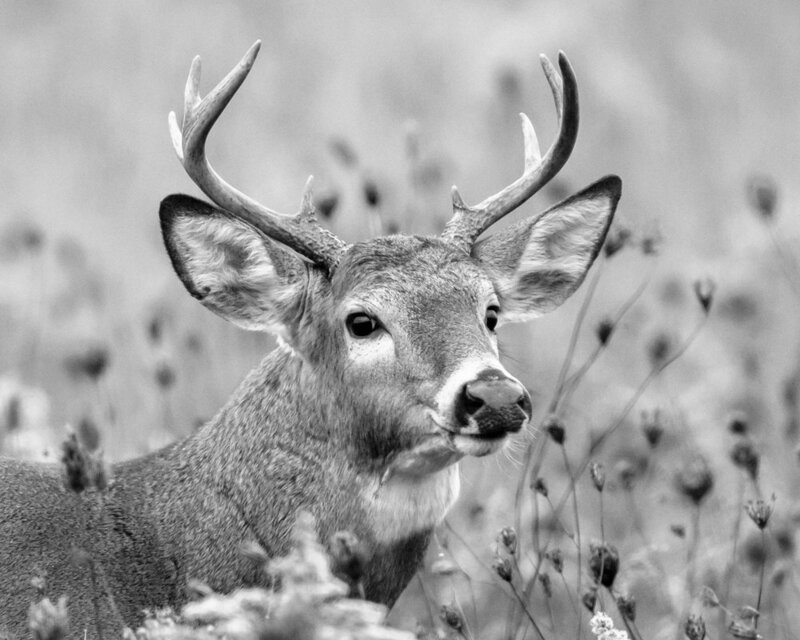 White Tailed buck in the fields near Whitby, Ontario. Canon 5DS with EF500mm f/4L IS II USM +1.4x III. 700mm, f/5.6, 1/200s, ISO 1600. I do think that the electronic shutter on the A9 is what I would like to see on a high resolution sensor the most. I realize that is also the most difficult and likely expensive thing to want. Silent shutter would be amazing for nature, however the implementation in any camera other than the A9 means that it is only really useful for static subjects. This is due to the amount of time it takes to access and push to memory all the the data from the sensor and currently means that you will notice motion artifacts in your shots on anything other that the A9. Buffer is the next issue when looking at high resolution and high frame rates. The ability to get >100 raw images before the buffer slows you down may seem like a lot but when action happens in nature I often will take 3-5 shot bursts and may need to do many of these until the action stops. Examples might be bull elk fighting or herons chasing each other. The solution to this will come in faster memory cards and larger memory buffers…both of these will increase cost of camera and not everyone will want to pay for it. Really what I’m hoping for is a combination of the Sony A9 and the Nikon D850 and I know if it comes out I’m going to not like the price. I do think a camera like this is coming, I just don’t know who is going to come out with one first. Sony has already shown most of the capabilities and the A9 shows they are willing to put something out there. Canon and Nikon both are likely to first try to come out with a fast 20-30 MegaPixel fast mirrorless camera for the upcoming Olympics and are unlikely to bother with a higher resolution one that also has high frame rates at this time since there are likely not that many sport shooters that are currently asking for that.